Burgh Island, famously the inspiration for the setting of Dame Agatha Christie’s best-selling novel ‘And then there were none’, is an iconic tidal island across from the beautiful beaches of Bigbury-On-Sea and Bantham. The only way to get to Burgh Island is via the sandy causeway from Bigbury-On-Sea (either on the sea tractor or on foot during low tide). What follows are directions to Bigbury-On-Sea, although it’s perfectly feasible to travel by car to Bantham Beach or further along the South West Coast Path and then walk to the causeway. Sat nav users can use the postcode TQ7 4AZ, which will take you to Bigbury-On-Sea car park. The nearest car park to Burgh Island (at Bigbury-On-Sea) is around 12 miles from Salcombe. Leave Salcombe on Salcombe Road (A381). Turn left to stay on the A381, signposted for Plymouth, Modbury, Totnes and Thurlestone. At the roundabout go straight onto the A379, signposted for Aveton Gifford, Modbury and Plymouth. At the next roundabout, take the first exit, which will take you onto Tidal Road/Stakes Hill. (Note that this is tide-dependent.) Alternatively you can go straight on, following the A379, then take a left at the next roundabout, joining the B3392 and following this road until you reach Bigbury-On-Sea. Continue until you come to St Ann’s Chapel. At the junction, turn left, following the sign to Bigbury-On-Sea (B392). Follow this road until the Bigbury-On-Sea beach car park appears to your left. Bigbury-On-Sea is around 21 miles from Dartmouth. 1Leave Dartmouth on the A3122 and continue for seven miles. Turn left at the junction, joining the A381. Take the first right, signposted for Moreleigh. Take a left, just as you enter Moreleigh. Follow this road until you come to a crossroad (California Cross). Turn left onto the B3392 and follow this road all the way to Bigbury-On-Sea. As you approach the beach, turn left to enter the car park. Leave Dartmouth on the A3122 and continue for seven miles. Take the second exit at the first roundabout you come to. Continue through Churchstow and turn right at the next roundabout, staying on the A379. Cross the Aveton Gifford Bridge and then take the first left at the roundabout, which will take you onto Tidal Road/Stakes Hill. Please note that this dependent on the tidal estuary. The 875 bus service runs between Plymouth and Bigbury-on-Sea. Click here to download a timetable. From Bigbury-On-Sea beach you can walk across the tidal causeway to Burgh Island or ride on the popular sea tractor. 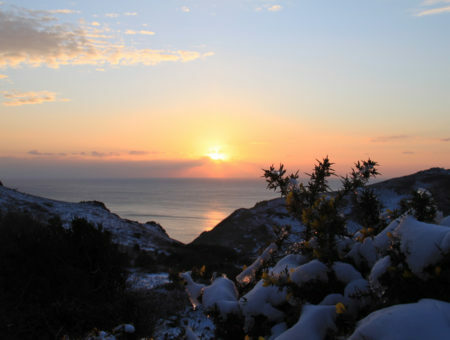 Walking along the South West Coast Path from Hope Cove, South Milton Sands, Thurlestone beach or Bantham beach will provide you with various levels of challenge and some amazing views. Salcombe to Bigbury-On-Sea is a popular walk for sturdy hikers with the stamina to manage 13 miles of winding Coast Path – at times it’s strenuous but well worth it for some of the most spectacular views in South Devon. A shorter walk from Hope Cove (around 4 miles each way) is another excellent option. There is a council-run car park at the edge of the beach, where parking before 6 pm costs £1.30 an hour (for up to three hours) or £6.50 all day. Charges apply for parking after 6 pm during peak season. For further details, see this car park’s page on the South Hams District Council’s website. You’ll find the full range of beach facilities across the causeway at Bigbury-On-Sea. Burgh Island is a fantastic place to spend a couple of hours or half a day exploring, taking pictures and enjoying the views. Looking out to the beach are two of the best beaches in the region, and indeed the country, so you can easily fill the rest of your day at either of these. 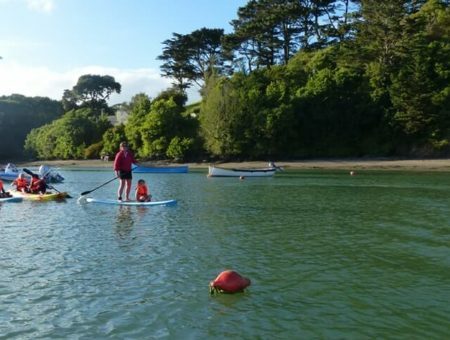 Bigbury beach has a prestigious Blue Flag award and popular Venus Café. 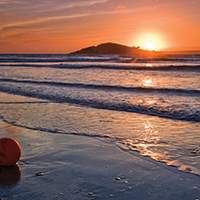 Bantham beach boasts some of the best surfing in the country, as well as the popular Gastro Bus for al fresco dining. 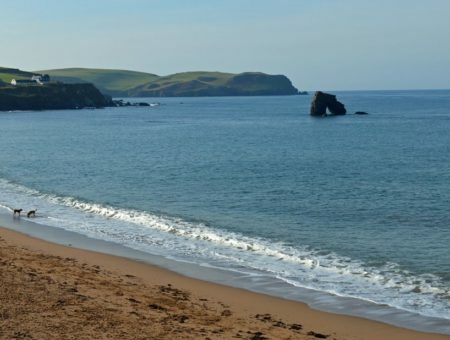 Burgh Island isn’t a beach as such, but we thought no guide to the best beaches in South Devon would be complete without some information about this famous landmark. It is after all, part of what makes a day at either and Bigbury-On-Sea so memorable. When the tide is in, the sandy causeway disappears and the only access to the island is via the ever-popular sea tractor – essentially a tractor on stilts which, in its current incarnation, has been ferrying visitors back and forth since 1969. Burgh Island sits about 250 m from the mainland and is criss-crossed with enticing walking trails (although be aware that the island is privately owned and access to some places is restricted). Apart from exploring and appreciating the views, many visitors like to stop by the Pilchard Inn for a drink or snack. For centuries a haunt for smugglers and wreckers, it’s now a popular spot to sit and look back across the causeway towards Bigbury-On-Sea, watching the waves lap against both sides of the beach as the tide rises and falls – a slightly otherworldly sight, as if you’re looking at a drawing by M. C. Escher! Visitors who are not residents at the hotel are welcome to enjoy Sunday lunch at the restaurant and can attend their black tie dinners in the evening, but not for tea, coffee or afternoon tea which are reserved for guests only. Booking is essential. Also near a vast golf course, explore 3 great golf courses in South Devon here. Bigbury-On-Sea, a charming coastal village with a Blue Flag beach, amazing views and some excellent walks along the Coast Path, is the perfect place for your holiday by the sea. 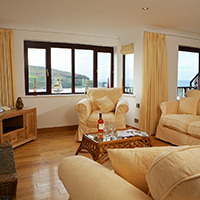 Take a look at our luxurious holiday cottages in this unforgettable spot. 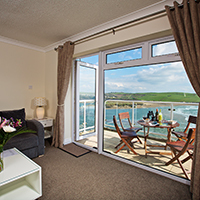 25 Burgh Island Causeway is a top-floor apartment which provides unrivalled, unforgettable views of the sandy beach and the famous island. Guests at this exclusive development in Bigbury-On-Sea are provided with access to the Leisure Club, with its indoor swimming pool, spa pool and gym. Located just 100 metres from the beach at Bigbury-On-Sea, 6 Tarifa provides comfortable and stylish accommodation for your coastal break. There are private terraces to enable you to make the most of the sea views towards Bantham, Thurlestone and the Avon Valley. 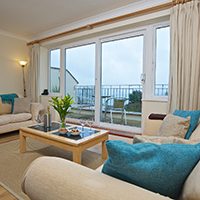 2 Avon Quillet is a first-floor apartment which has been recently upgraded and decorated to a high standard, providing you with a comfortable base as well as some stunning views out towards Burgh Island and Bigbury Bay. Visit our South Devon Beach Bible for information about all the best beaches in South Devon.